Skafta is a mixed glacial and spring fed river. Most of the glacial discharge originates from the Skafta Glacier and some of the mixed water from Lake Langisjor through its discharge called Utfall. The river’s volume is at its greatest during warm summer days and sudden glacier bursts. Among the many tributaries of River Skafta in the interior are the rivers North and South Ofaera, Grjota and Hellisa. The discharge area is close to 1,400 miles square and its average flow is about 122 m3/sec. or 87 l/sec. per km2. 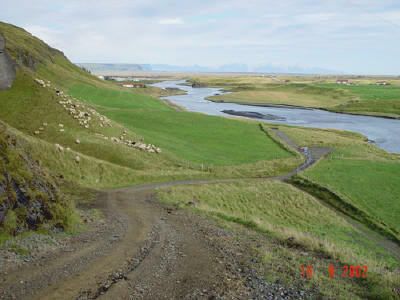 In comparision River Skjalfandafljot in the North has an average flow of 24 l/sec. per km2, which goes to show the difference in precipitation. Glacier bursts are common and they are accompanied by the strong smell of sulphuric acid. They originate to the nortwest of Lake Grimsvotn in the middle of the Vatnajokull Glacier. During the 1783 eruption of Laki, the canyons of River Skafta were totally filled with lava and since then the river does not have any real course, where it cascades on top of the lava field. Above farm Skaftardalur it drops 9 metres and creates a waterfall. Directly to the west of the farm it widens and runs in many branches, which unite further to the south to create three main branches for the rest of the way. One of them, Eldvatn, joins River Kudafljot; the second, Arkvislar, disappears into the sanded lava field from 1783; and the third one, Skafta, continues along the low mountains to the east. The third branch almost disappears during extremely cold spells in winter.